Digital Marketing is moving up with the era of big data. As information shared digitally increases each day the enormous collection of big data increases significantly as well. Brand marketers and sales professionals have clearly embraced the era of big data along with its ever increasing challenges. Forbes predicts companies will be increasing use of big data analytics 5X by 2020. The below figure shows the projections of big data spending in major business category. Companies will spent most of their money to use big data to understand customer behavior and enhance customer experiences. The information generated from big data has enabled real time sales visualizations and dramatically improved the way brands are now predicting their sales. Whether the business is small, mid-sized or multinational big data can help target high volume targets more efficiently and integrate the various digital branding options to cater to the customer’s needs. Since customer preferences are changing very rapidly it is essential for brands to respond quickly to these changing needs. A study by Oracle suggests that companies are now investing time and money on big data analytics to improve market competitiveness and also improve productivity. Big data enables brands to treat their customers as individuals. In terms of social media data there are some over whelming figures of the amount of content that is being generated daily in the digital space; 5700 tweets happen every single day and Twitter has about 500 million users as of today, Facebook users share 2 billion pieces of content each day. 84% of marketers are realizing the importance of content in digital space and its role in creating value for the brand. Improving ROI with Big Data …. Southwest and Delta airlines used big data to improve communication between the airlines personnel and customers. The airline launched an app to help customers who lost their baggage or did not receive their baggage to track it on their mobile devices by checking in the app. Delta airlines reported a total of 130 million checked bags every year through this app. The tracking data makes it easy for the airlines and the customers to interact and take action if there is a problem. The app has been downloaded about 11 million times. Southwest uses a highly developed customer aggregation data tool that helps it promote offers and loyalty programs through multiple digital channels for their customers. The benefits of this kind of data centric approach is that airlines are now able to gather and analyze customer information under one roof thus enabling them to take quick actions whenever required to resolve customer problems. Big data opens a huge opportunity for businesses across various segments such as Retail, Travel, Finance and Entertainment to create experiences that can improve ROI dramatically and reveal customer intent. By centralizing customer data brands are able to leverage big data in their marketing strategies effectively. A holistic view of customer’s shopping preferences, interactions and intent can be integrated in a single data view for seamless functioning of the marketing team. Big data seems to be delivering the expected ROI for many businesses today. A study by McKinsey suggests that global data with grow by 40% per year and will be a major contributor in helping brand segment populations and add human touch to advertising. 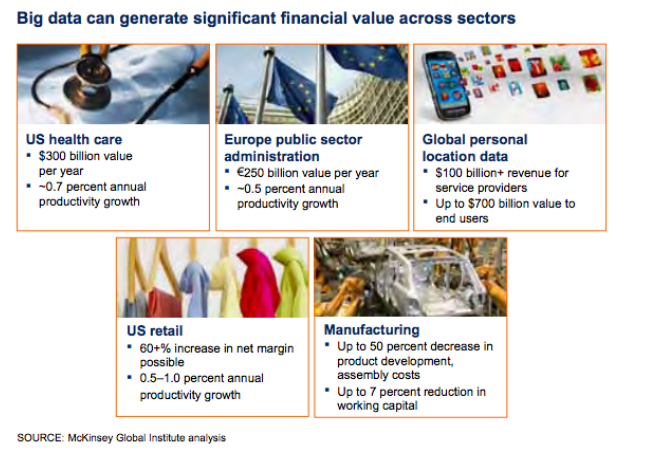 Big data is creating value with all major sectors. McKinsey‘s research suggests US healthcare will witness $300 billion value created by big data per year in terms of capturing customer insights and product innovations. With effective use of big data companies can deliver economies of scale. Brands need to recognize potential of Big data and the value it can create to help deliver successful marketing campaigns in future. Do share with us your brand’s experience with big data analytics. For more information visit us @ Connatix or simply leave us a comment here.